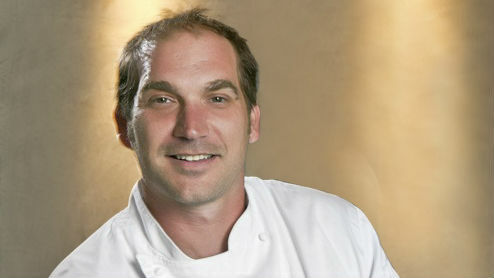 Jason Gethin, executive chef of Table No. 10 in the East Village. Table No. 10, a new restaurant from chef Jason Gethin and restaurateur Cooper McLaughlin, opens Tuesday in the East Village with a menu of modern American fare and craft cocktails. The new restaurant is located at the corner of 10th Avenue and J Street. Gethin, formerly from Union Kitchen + Tap in Encinitas, partnered with McLaughlin, who owned The Corner on the site. The two remodeled the space to create Table No. 10. Gethin and McLaughlin say the restaurant differentiates itself from nearby sports bars by offering a variety of small plates and entrees. An example is ravioli stuffed with goat cheese and pine nuts served with pine needle brown butter under a dollop of parmesan foam. Larger plates include Kobe beef brisket and Colorado lamb bolo served with tagliatelle pasta and house ricotta. Each menu item is paired with a mixed cocktail, wine or beer. Cocktails include such eclectic ingredients such as jalapeños and duck fat. The restaurant’s name refers to the chef’s table, located adjacent to the kitchen.